Far better than you'd expect. . .
Elewhere on this site, should you wish to find it, there's a review of a ground-breaking one piece suit by an American company called Aerostitch. It's ground-breaking because it's a one piece suit designed to be worn over your normal street clothes and intended to be easy to put on and take off, making the whole ride to work process a bit less of a pain. It's a truly great suit, suffering from only three things. If you want a new one you need to work out your measurements and order it online from the factory in the USA. Which is a bit slow. You'll also have to part with a very sizeable chunk of your disposable income. Plus a bit extra for the VAT man. And finally, when it does arrive you'll find you have to break it in for a while before it's comfortable, and even then it leaks after a while. (Caveat - apparently the very newest ones don't.) I still use mine and I love it. But there's an alternative. 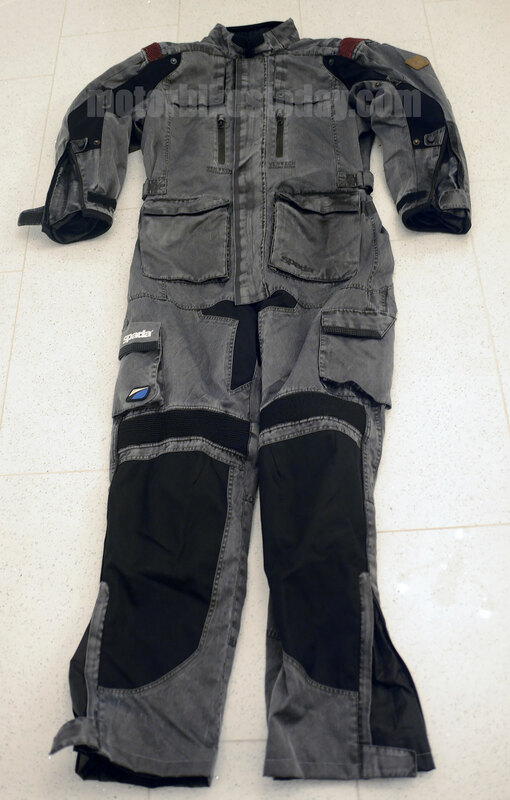 The Spada Stelvio is a one piece oversuit incorporating armour in most of the places it's needed and is designed to fit over your regular clothes. It's available from dealerships across the UK and is adjustable enough that if it's roughly the right size it'll work. And it's comparatively inexpensive. Actually that's not fair. It's comparatively as cheap as chips - it's just relatively inexpensive compared to most decent bike kit. It only comes in one colour - a slightly bluish grey with black panels and a couple of brick red shoulder flashes. For a utility garment it's actually pretty smart, and as I mentioned earlier there is enough adjustment to make it fit quite nicely, even allowing the rider to have a visible shape rather than the more traditional "fits where it touches" seen with most oversuits. The Stelvio has CE approved protectors in the elbows, knees and back, and is made of a reassuringly solid feeling material that ought to give you a sporting chance of not coming into direct road contact. It's got loads of pockets, all of which appear so far to be waterproof and several of which are very conveniently placed as well. They're also designed so that your keys and so on can't fall out when you get on the bike, even if they aren't properly closed. Which shows some smart thinking from people who get how it'll actually be used. The suit has a single long zip which runs from neck to crotch. It's easy enough to get in and out through, but it isn't as convenient - or quick - as having a neck to ankle zip like some other suits. Of course that also means it isn't as likely to leak around the knees where the zip has to bend. Or indeed where the zip goes through the crotch - there's nothing quite like getting to the office looking as though you've wet yourself to start the day all wrong. But anyway, getting into the suit requires you to have be in your socks, and if you're in a hurry, tucked your trousers into them. Yes, it sounds awful but nobody can wee when you've got the suit on so it's OK. Put both legs in and then the rest is easy. Boots need to go on afterward, and again must be inside. 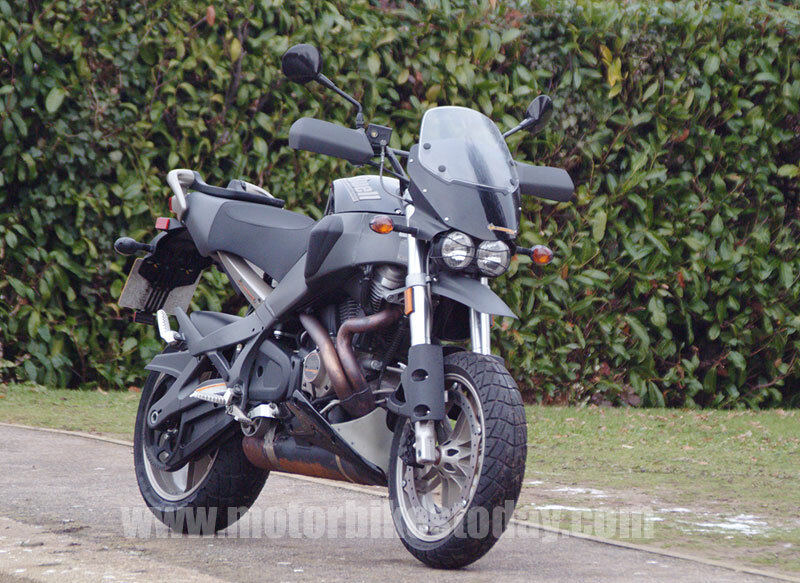 Happily the ankles are loose enough to even accomodate motorcross boots so that shouldn't be a problem. The top part just goes on like any normal jacket, and the central zipper is good quality and does up easily. It's a good idea to take the opportunity when you put the suit on for the first time to adjust the wast-belt and the press-stud adjusters on the sleeves to make the suit fit you a bit better and avoid flapping material. It's really easy to adjust and definitely worth it from an aesthetic and functional point of view. 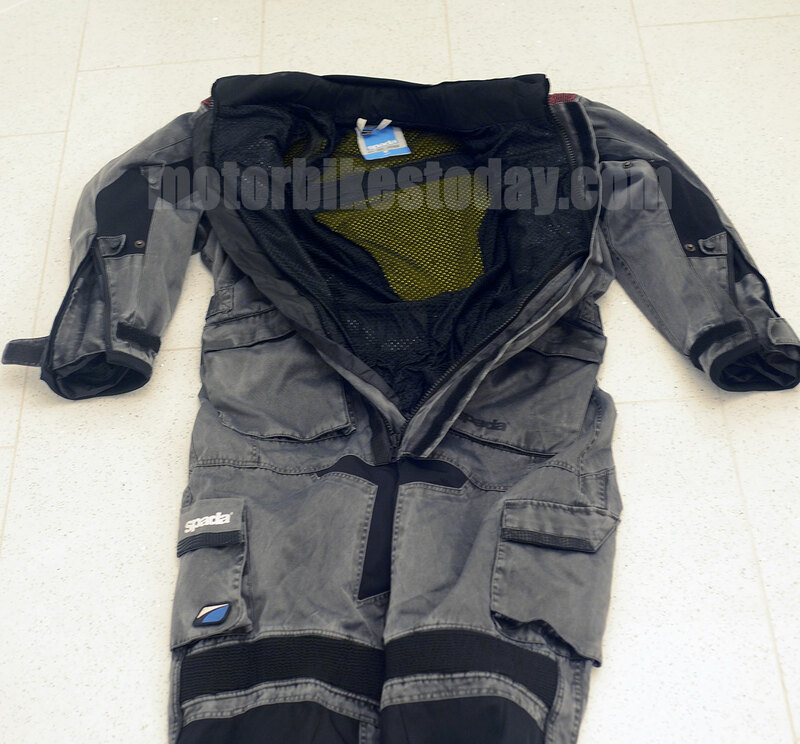 Now many oversuits these days rely on super-trick materials to deliver light weight, waterproof, warm and safe kit. Which of course is fine if you're aiming at what marketing folk call, I believe, a premium pricepoint. This suit isn't aiming at that, and so it doesn't use super clever materials. It does use good quality materials in a well established way, but there's nothing wrong with that. Instead of paying a licence fee for a well-known waterproof textile material, Spada have instead opted for an outer skin that is strong and functional but not fully waterproof, and an inner "drop liner" that is fully waterproof. It works, but it's really important that you put the cuffs outside your gloves, otherwise the water runs down the drop liner and fills your gloves up, no matter how tight the glove wrist binding. I forgot this and discovered the hard way just how much water would come in. Unfortunately it was when I still had about an hour of riding through a snowstorm, and my hands were bloody frozen. But the rest of me was dry. So let's look at the performance. First of all, though unlined the suit is warm enough. Just. So far the worst I've put it through was a minus five (centigrade, so about twenty-three fahrenheit) early morning ride. Yes, I needed a thermal sweater over my work shirt, but that's actually it. I wasn't exactly toasty warm but I wasn't cold either. As the weather warms up I will start to use the myriad of vents that Spada have fitted, and hopefully will be able to report genuine all-season usefulness. Secondly, I've ridden several hours through torrential rain, heavy snow, fog, drizzle, hail - basically a typical British winter - and can say without any shadow of a doubt that the suit does not leak. Anywhere. You do get a slightly weird damp sensation if it's cold as well, but I think that's from having cold water running down the outside of the waterproof drop-liner and perhaps causing a bit of condensation. I don't know, but I do know that when I got in after the longest of those rides I was sure I had wet arms...but didn't. So I guess it works. It isn't all rosy perfection though, sadly. While there is armour in the form of CE protectors, and while its comfortable and unobtrusive, the pouches in which the elbow armour in particular are housed are too big and so it's free to move around rather too much. End result is that you could easily not have armour where it needs to be when you are depending on it. It's fixable, definitely, and you could sort it out yourself I think. But that's not really the point. While we're talking about armour, the omission of hip protectors is surprising as well as a notable weakness in the suit's protective capabilities. Again, it wouldn't be that hard to attach some aftermarket armour using velcro or similar, and it would still make the suit dazzlingly good value for money, it just shouldn't be necessary. Finally it's a little too easy to foul the liner when you're doing up the ankle zips. Not a disaster, but it means it takes longer to get dressed to go. Keeping a finger behind the zip so the liner is out of the way works, but this is something that seems to be a common trait with both the Spada suits I've tested, so maybe it's an inevitable function of the drop liner. I just know it's irritating. So let's sum up. The Spada Stelvio comes in at a recommended price of just £299. That is staggeringly good value for money - it's about a fifth of an Aerostitch. It's a good looking piece of kit, far better in fact than just about any other one piece suit I've seen. It is genuinely waterproof and warm enough for an average British winter. Despite the criticisms above there's actually very little not to like. I can only say that I'm really glad I've got it, and thoroughly recommend it.